Every year, our troupe, along with Hilliard Davidson and Hilliard Bradley theare troupes, participate in a service to our community. The students go out from house to house during beggars night and collect can goods for the Mid Ohio Food Bank. This service is one where we have literally collected TONS of food for the needy in our community! Section 1. Name: This organization shall be called Troupe # 5658. The troupe has been chartered by Hilliard Darby High School. The charter affiliates it with the International Thespian Society (ITS), a division of the Educational Theatre Association (EdTA). Section 2. Purpose: The troupe is the honors component of the school’s theatre program. Its purpose shall be the advancement of standards of excellence in theatre. 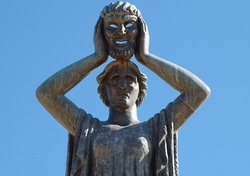 More specifically, the troupe will encourage students to attain a better mastery of the theatre arts and will reward those who achieve it with induction into the troupe. Thespians achieving honor ranks shall receive recognition of their exemplary accomplishment. Section 3. Governance: This troupe constitution and its bylaws are two components of a hierarchy of documents that govern the Educational Theatre Association and its membership. The documents affecting troupes, in order of authority, are: the Educational Theatre Association Code of Regulations and Membership Policy, the troupe handbooks, the troupe constitution, and troupe bylaws. This constitution may not be altered in any way that conflicts with a superseding document or school policies and procedures. Section 1. Membership: Membership is achieved by complying with all induction criteria as defined in the troupe handbook. The ITS Thespian point system is the official guideline for awarding induction points. Any changes to induction criteria, including the Thespian point system, must be adopted as a troupe bylaw. Section 2. Officers: The Thespian troupe shall have the following officers: president, vice president Drama, vice president Tech, Secretary. Front of House Manager and Promotions/Business Manager. Duties shall be defined in the troupe’s bylaws. Section 3. Elections: The Officers shall elect/interview for officers for the next school year in the last full month of the current school term. Section 1. Meetings: Thespian troupe meetings shall be held monthly throughout the school year. Special meetings may be called by the troupe director, any officer, or by a quorum of Thespians. Section 2. Quorum: A quorum shall be a majority of the troupe’s active membership. Section 3. Denial of participation: Any Thespian who causes deliberate dissension or disruption of any production or business meeting may be denied participation in troupe activities by a vote of two-thirds of the troupe’s membership and the consent of the troupe director. Any member requesting reinstatement of participation rights may have them restored with the consent of the troupe director and two-thirds of the troupe’s membership. Section 1. Dues: There shall be no mandatory dues for Thespian induction except as provided by the Educational Theatre Association Board of Directors. Section 2. Fees: Troupes may approve additional fees for local Thespian troupe participation. This requires consent of the troupe director and a two-thirds vote of the active troupe members at a regular troupe meeting. The school and its troupe director may also assess user fees in accordance with school policy. Section 1. Purpose: Bylaws provide additional guidance for the governance and operations of the troupe. No bylaw may be in conflict with the EdTA Code of Regulations, EdTA policies, troupe handbook, troupe constitution, or school policy or procedures. Section 2. Adoptions and amendments: The troupe director may adopt or amend bylaws as deemed appropriate. Bylaws may also be added or amended by approval of a simple majority of the troupe’s active membership and the consent of the troupe director. Section 1. Exclusions: Article I may not be amended. Section 2. Procedure: Articles other than Article I may be amended by approval of two-thirds of the troupe’s active membership with the consent of the troupe director. This constitution and its amendments shall be subject to change according to any or all requirements of the International Thespian Society. Section 1. A student arriving late to or leaving early from meetings or rehearsals without a reason considered valid by the troupe director will receive a demerit. Three such offenses will be counted as an absence from a meeting without excuse. Section 2. Regular after-school meetings will begin at 3 p.m. and evening meetings at 4 p.m. Changes will be posted by 2 p.m. the day of the meeting. Section 3. Irregular attendance indicates a lack of interest; therefore, any member absent four (3) meetings per school year without a written excuse submitted to the Troupe President, Vice President, or troupe director shall be automatically suspended from troupe activities. The troupe director has sole authority to reverse the suspension. Section 4. Attendance shall be considered in the Thespian points award system. Section 5. Absences shall accumulate for only one school year at a time. Section 1. Induction points must be earned over the course of more than one production. In years when there is only one production, this requirement is waived. Section 2. Induction points will be awarded for theatre-related work done outside the school’s theatre program. To qualify for points, a copy of the program or other verification must be provided. Section 3. One induction point may be earned for attending non-school productions. To qualify, a ticket stub or a program must be provided as proof of attendance. A critique of the show (two-page minimum) must be submitted within one week of the production. Section 4. All Thespian Points will be awarded through the troupe director through an interview process. If an interview in post production is not set up by the thespian troupe member, no points shall be awarded. Section 1. An induction ceremony shall be held at least once each year. Additional ceremonies may be held as often as deemed necessary by the troupe director. Section 2. Induction fees are the responsibility of the inductee. The troupe will pay for induction pins and other honors items. Section 3. The troupe director determines the time, place, schedule, and format of induction ceremonies. Section 4. The troupe director and president conduct inductions. The vice president(s) is responsible for training induction ceremony speakers, scheduling and rehearsing said speakers, and preparing the stage and induction properties as directed by the troupe director. Section 1. Duties: Troupe officer duties are defined below. The troupe director may assign other duties. A. The troupe president presides at all meetings and Booster Meetings, appoints all standing and special committees, and directs and supervises troupe activities. B. The vice-president(s) presides in the absence of the president and is responsible for the induction of new members. C. The secretary keeps the records of meetings and attends to troupe correspondence/point interviews. D. The treasurer keeps the troupe’s books and pays bills, and may act as business manager of Thespian productions. E. The clerk/scribe/business Manager keeps the point records of all activities: plays, production dates, casts, crews, and work accomplished as provided in the official point system. For troupes without a historian, the clerk may also keep a scrapbook of news clippings, posters, programs, etc. F. Other offices such as historian, publicity chair, and TOTS-EAT (Trick or Treat So Kids Can Eat) chair may be added at the troupe’s discretion. All officer positions must be listed in the troupe’s constitution. Section 2. Requirements for all elected officers are as follows: each student must be an active member of the troupe for at least one school year, and at the time of election must be enrolled in grades 10 or 11. Section 3. Nominations for officers are to be made by a committee, meeting with the troupe director, with additional nominations being permitted from the floor. Students may self-nominate from the floor. Officers will be elected by a majority vote. Section 4. Elections/ Interviews will be conducted at the 2nd to last troupe meeting for the current school year. Section 6. Three members, including one officer, may request a recall election of all or any elected officers. This request must be submitted to the troupe director in writing and state the need for such an election. A special meeting will be scheduled within five school days upon receipt of the request for the purpose of voting on whether or not a recall election is necessary. Two-thirds of the membership is required to mandate a recall election. If a recall election is necessary, election of officers will follow the procedure set in Sections 2–4 above. Section 7. Officers shall be installed at the last social or program meeting of the school term. Section 1. The troupe is not a secret organization. All interested faculty, students, parents, Honorary Thespians, troupe alumni, and administrators are welcome at troupe meetings. Section 2. At least one meeting or special event of Troupe #5658 shall include an open invitation to all students for the purpose of playing theatre games and creating improvisations. Section 3. The troupe shall sponsor at least one “good neighbor” program a year for the purpose of establishing good relationships with nearby Thespian and Junior Thespian troupes and other dramatic groups. Section 4. The troupe shall cooperate with all other departments and clubs in the school in helping them with their programs in any way it can. Section 1. Each grade shall have one elected representative. Said representatives will be elected the first business meeting of the school year. Section 2. The duties of each representative will be to distribute newsletters, collect membership money from classmates, inform his/her grade of any new information, and aid any officer if requested to do so. Section 1. In the event issues/conflicts arise between a Thespian and the troupe director that cannot be solved through communication between the two parties, the issue should be resolved by the school administration as indicated in the troupe handbook. Special Note- Troupe Directors can give any point value that they feel a student deserves based on the responsibility displayed by the student.